The unknown – it’s exciting, scary and often avoided. In 2012 while reading a blog post by Suzie Cooney (certified personal trainer – Suzie Trains Maui) I heard about an open ocean, down wind race event. It was the Olukai Ho’olaule’a – and Suzie inspired us to give the 3 mile “fun race” a try. We were hooked after the fun race (luau, music, sailing on the Olukai sailing canoe and the spirit of aloha) and started training for the 2013 full Olukai Ho’olule’a run from Maliko Gulch to Kanaha Beach Park. The conditions for the 2013 event were the worst(according to many locals) in the five years the event had been run. Winds was light or from wrong directions and the swells were breaking huge on the inner reefs. Deep ocean swells were coming chaotically from directions that didn’t invite an easy connection of glides. Here’s where confidence made all the difference. Living in Oregon, far from Maui and the type of conditions I selected for my favored racing environment, many resources allowed me to be fully prepared for absolute fun and my best Maliko run to date. I continued to train with motivation and advice, stories and smiles from Suzie Cooney. 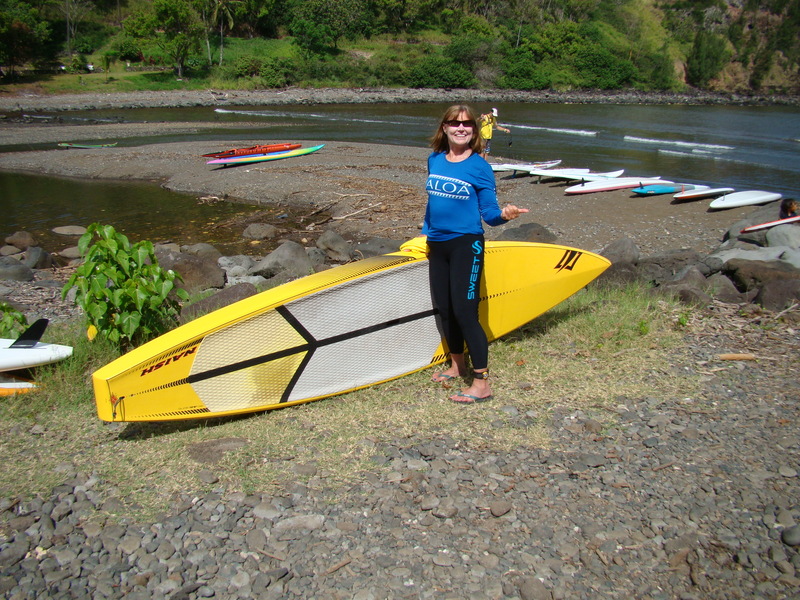 The team at Naish Maui Pro Center listened to my adventure with the 14′ race board and helped me select the 12’6″ Naish Glide for this year’s Olukai Ho’olaulea. The video below shows highlights. I was confident, stable and caught dozens upon dozens of swells and glides. After almost a year riding and paddling, catching waves and racing on my inflatable 12’6″ Naish ONE I hit the water ready for fun! The wind was more fresh (Yay) than expected and it was a headwind workout to get to the starting line. I put my head done and started cranking up my speed to get there in time for the start. Confidence-builder = hearing the cool, calm voice of Suzie Cooney who’s always ready to share her expertise on the water. “Slow down, stay calm, and save your energy for the event,” she said with a grin. And before I knew it, we were off – and it was SO MUCH FUN. I placed better than I expected among the top 30 women – and what’s more. I gained so much confidence that my next down wind races will be on the newly designed Naish Glide 14.0 GS. 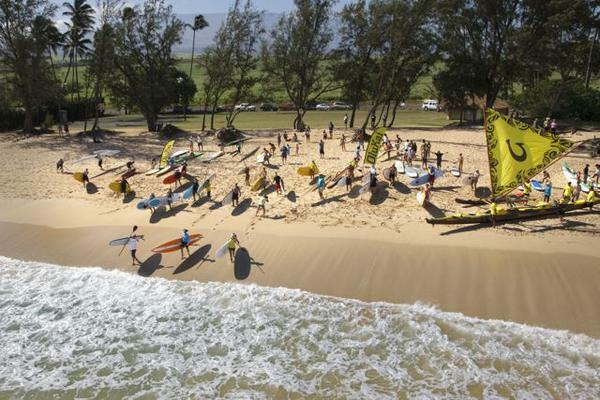 Locally I can rent one from Big Winds for the Naish Columbia Gorge Paddle Challenge and reserve one on Maui at the Naish Maui Pro Center. Read more on 5 Steps to Build YOUR Racing Confidence. 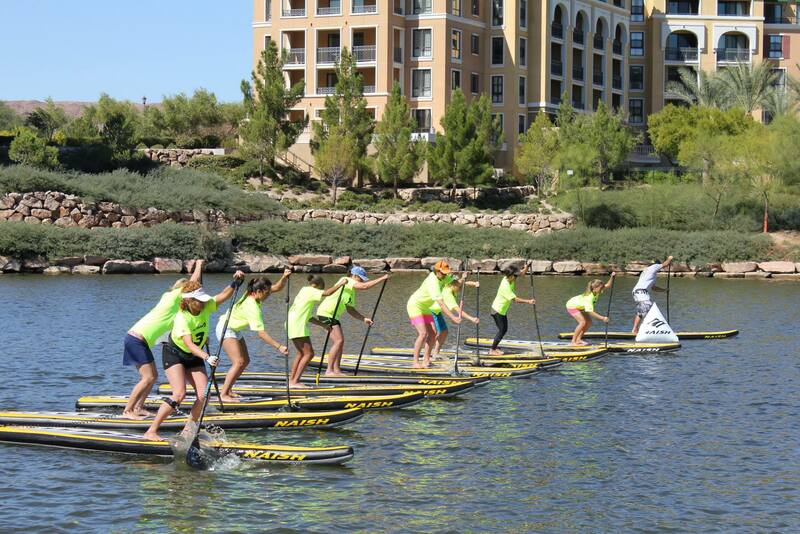 This entry was posted in Equipment, Journeys and Quests, SUP Racing and tagged Bid Winds, elder sup, Ho'olaule'a, Naish Glide, Naish Maui Pro Center, Naish One, OluKai, Suzie Cooney by Water Words. Bookmark the permalink.